Yahooooo!!! Tama hula ko - Anne Curtis! Pero Mali hula ko sa leading man - well I guess di Tuloy lipat ni Richard G.
But then since Anne Curtis is Dyesebel, I am now more than excited for this!!! WHOOP! Ohhh so tama yung mga hula this morning sa twitter that it would be Anne and Sam. Na-surprise lang ako na kasama si Gerald Anderson. A pleasant surprise though! Kaya lang, sino ang Fredo talaga? Hehe. Tingin niyo? DIYOSA AGUA AAHON NA BILANG DYESEBEL.. I swear mag-aannounce bigla ang GMA, replacing Louise Delos Reyes for Carla Abellana? So Sam-Anne dito sa Dyesebel, tapos sila pa rin magkasama sa The Gifted (Viva/Star Cinema)? Ang mukhang mas malaki ang possibility na lumipat is Dennis Trillo hehe. gosh.... DenBea for Sana Bukas? Anne Curtis is set to play the role of Dyesebel this 2014. In an announcement made by Dreamscape at the ABS-CBN compound this January 9, it has been revealed that the iconic role will be played by the actress. "It's another dream come true po. Sobra lang akong speechless kasi napakalaking project na 'to at mahilera sa lahat ng naging Dyesebel, I’m sure at one point lahat kayo nag-interview sa akin at ng tinanong niyo kung ano ba ‘yung dream role ko sinabi ko naman Dyesebel. So ito na 2014, a great way to start the year na makuha ko ang isang dream," Anne said. Anne learned that she will be playing the role yesterday after she arrived from Canada. “Actually kakarating ko lang po galing Canada at nalaman ko lang kahapon (January , kahapon lang po sinabi sa akin at nagulat po ako, agad-agad ang presscon at announcement and it's overwhelming,” she shared. After the controversy Anne was involved in the latter part of 2013, the actress also said she is very thankful that people continue to trust her with projects like this. She says she has left all negativities in her life in 2013 and she has learned a lot of valuable lessons from the incident. 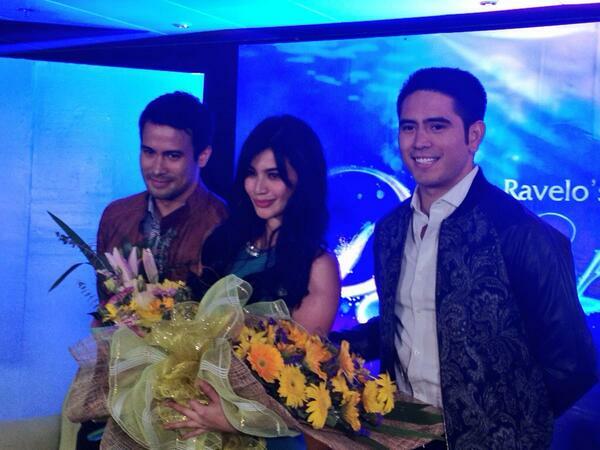 Anne’s leading men in the teleserye will be Sam Milby and Gerald Anderson. Sam will be playing the role of a shokoy named Liro while Gerald will play Fredo, the human who falls for Dyesebel.